A work of art that beautifully combines form and function. Introducing the FC10, the ultimate fanless HTPC case. The FC10 follows the same vision as the FC9, a stunning design that delivers new levels of compatibility and performance, but with a 435mm wide form factor that perfectly complements any home theatre setup. 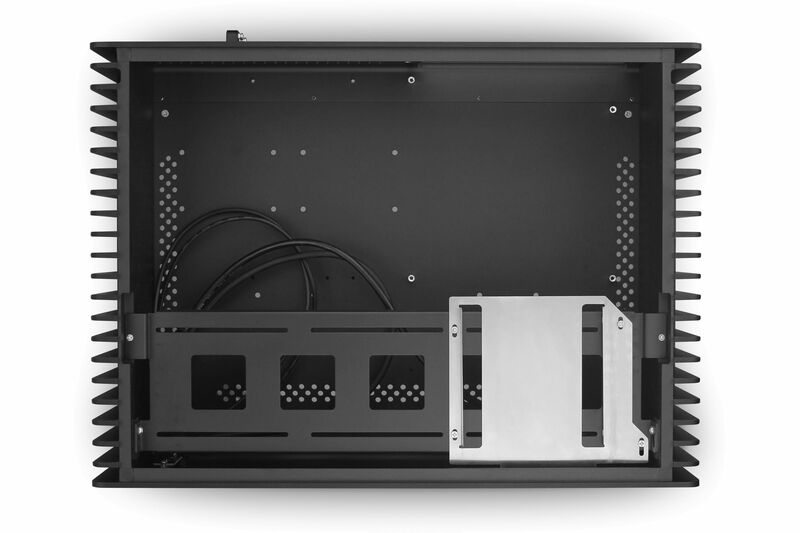 The all-aluminium sandblasted finish houses a multitude of features such as Heatpipe Direct Touch cooling, universal optical drive eject button and a pivoting drive cage that makes assembly easier than ever. More than just a computer enclosure, the FC10 is a work of art that beautifully combines form and function. Many home theatre chassis are finished with the brushed aluminium effect, but the FC10 is not like other home theatre chassis. Streacom have finished the FC10 in a very fine shot-blasted finish which gives an elegant pitted look to the aluminium rather than a lined look which brushing produces. It is all down to personal preference as to which looks better but one advantage that a shot blasted finish has over a brushed finish is that it does not leave visible fingerprints behind as brushed aluminium finishes often does. 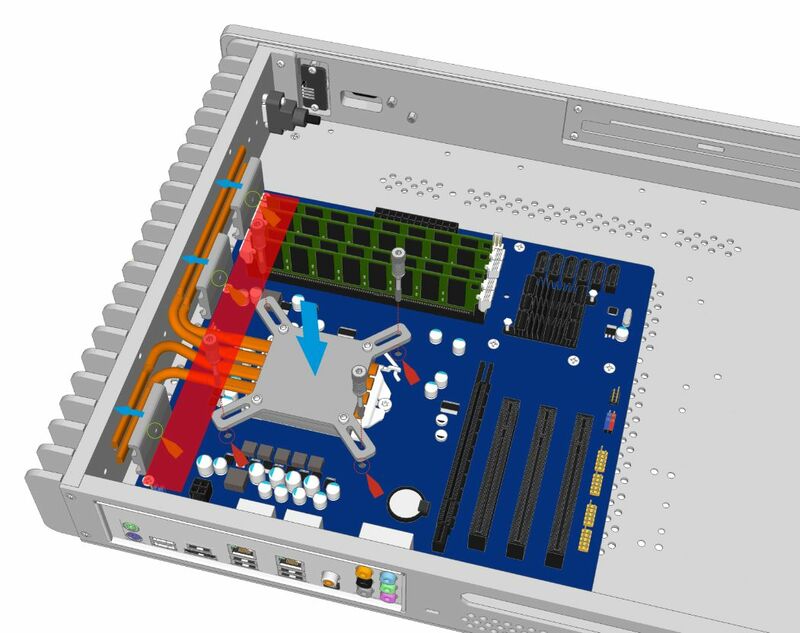 Motherboard and CPU - The FC10 is compatible with Mini-ITX, Micro-ATX and ATX motherboards. Depending which motherboard you opt for will determine how many HDD/SSDs can be installed (more info on this below) and which CPU to use. The case is capable of cooling virtually all CPUs that have a TDP of 95W or lower. One important point to note when selecting a motherboard is that the board must not have the 24-pin ATX connector (shown in the red shaded section in the image below) or any tall heatsinks are located in this area otherwise the Nano-PSU adapter may obstruct the heatpipes, preventing the CPU block from being fitted correctly. 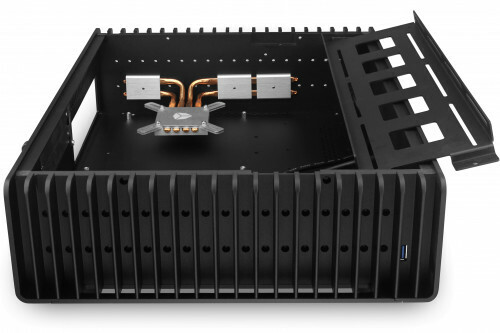 Note: Although it is stated that the overall cooling ability of the case is 95w we strongly advise using a processor with a TDP of 65W or lower to avoid using too much power than the Nano-PSU can provide. We have a selection of Intel LGA1155 CPUs available that produce 65W or lower which can be found here. To increase compatibility Streacom have a CPU Cooler Riser that raises the CPU heatpipes above conflicting components. The riser gives the included heatpipe solution an additional 32mm of clearance above the CPU. Power Supply - We recommend using a fanless Nano PSU which can provide up to 150W of power. This is more than enough to power a CPU that has a TDP of 65W along with suitable peripherals. It is recommended not to overload the number of peripherals; two HDDs (or one SSD and one HDD), one optical drive, a TV tuner and obviously a motherboard should not be a problem for this miniature PSU. Alternatively, Streacom now has available a 240W Internal fanless PSU, the ST-ZF240. That extra 90W (compared to the Nano-PSU) will allow for even more drives to be connected to the system or you may want to opt for a CPU that has a maximum TDP of 95W for greater performance. The ZF240 works best when installed into the chassis. Optical Drive - The FC10OD uses a new universal eject mechanism so it will work with any slot loading laptop drive regardless of where the eject button is located on the front of the drive. Streacom have already sourced the perfect drives for these cases, take a look at the available drives here. Please note the WS chassis do not support an optical drive. SSD/Hard Disk Drives - The FC10 cases can house many drive combinations depending on which size motherboard is fitted or which PSU is used. The instructions from Streacom's website go through in detail the options that are available. It is highly recommended that you take a look at their instructions, pages 12 and 13 detail the drive options. Please Note: - The two backplates on the back do not use a standard spacing so you can not fit a graphics (or other expansion card) that has a dual backplate. Drive Capacity Minimum 2x 3.5"+ 3x 2.5", Maximum 5x 3.5" + 4x 2.5"
USB cable quality should be increased and safe feet must be raised for cooling.